Late at night, in a seemingly normal neighborhood, a monster appears. The story of the first mysterious encounter with Digimon! Diaboromon is back and is planning another invasion upon the Real World. 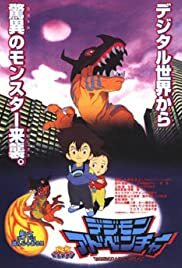 Three kids get transported to the Digital World where they must save its specific zones with the help of Shoutmon, an energetic digimon inhabiting the world.